Selecting the best studio monitors and setting them up correctly in your mixing environment is one of the most critical elements in creating mixes that will translate well to any speakers. Just about anyone who has ever mixed a record has experienced the frustration of getting a mix that sounds amazing through the speakers in their mixing environment, only to put it on their car stereo and wonder in confusion, “Hey! Where did the lead guitar go?” The likely culprit is either the monitoring speakers themselves of the way they're set up in the studio. 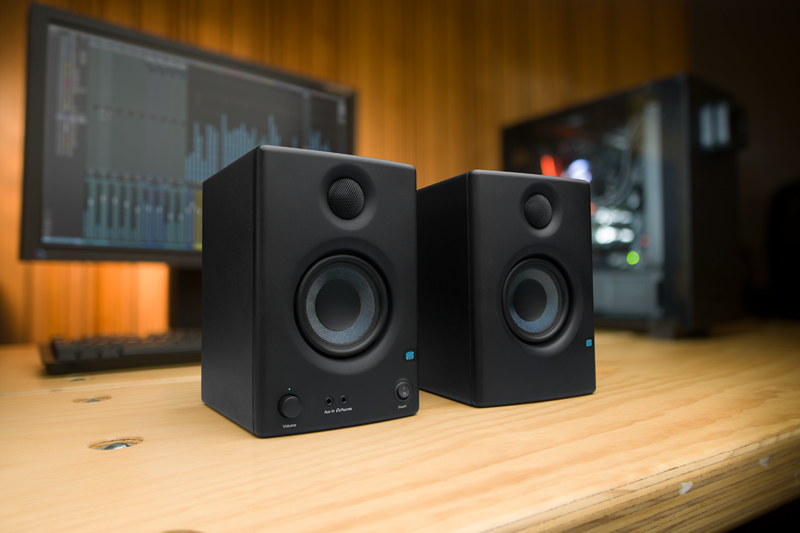 PreSonus has put together this brief tutorial to help you pick out the best studio monitors for your budget. A companion article explaining how to set up studio monitors in your mix environment is available here. Next to your ears, the speakers on which you're monitoring your mix are the most important part of your studio. 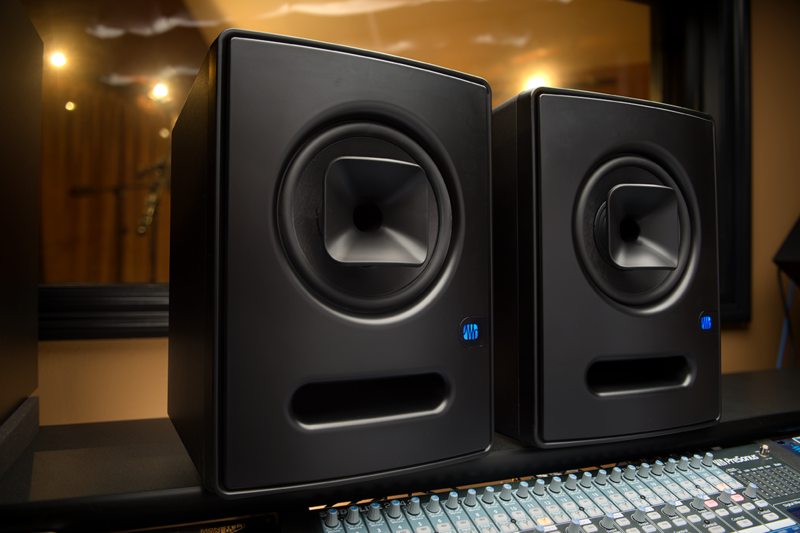 Investing in a pair of high-quality studio monitors will make mixing easier and less fatiguing and will help you to become a better engineer. Fortunately, a good monitoring setup is possible on any budget. Like any well-designed speaker, high-quality studio monitors accurately reproduce frequencies across the audio spectrum. The difference is that studio monitors are designed to reproduce the flattest frequency response possible. Why is it important to have a speaker with a flat frequency response? Mixing on speakers that don’t provide an accurate frequency response is like trying to drive a car with a very dirty windshield. Colors will have the wrong hue, details in the landscape won’t be visible, and blind spots will be exaggerated. A flat frequency response helps you to more accurately hear what has been recorded. In the past, many affordable reference speakers were designed to make music more pleasant to listen to, which meant that they boosted or cut certain frequencies for a more flattering aesthetic result. 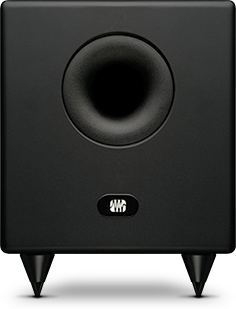 The good news is that there are now many affordable studio monitors that provide a flat frequency response. The first big consideration when selecting studio monitors is your mixing environment. Unfortunately, for many project-studio owners, this can’t be easily changed. How big is your room? If you’re mixing in a small room, a studio monitor with an eight-inch woofer might overpower the space. On the flip side, if you’re mixing in a large room, you’ll want bigger speakers so you can run your monitor system more efficiently. How close are your neighbors? If you’re mixing in an apartment, you may want to consider smaller speakers that sound great at lower volumes. Once you’ve evaluated your listening environment, go listen to some speakers at your local music store. Be sure to take along a comprehensive assortment of well-mixed recordings with which you’re familiar and that reflect the type of music you’ll mix on your new studio monitor system. Keep in mind that MP3s can sound brittle and harsh on higher-fidelity speakers, so don’t use compressed files. You should also keep in mind that the listening environment in a music retailer is not always optimal. If you think this might be the case, it may be a good idea to rent two or three of the potential candidates and take each pair of speakers for a test drive in your mix space before purchasing your final selection. Bass response. Is it tight and controlled or boomy and poorly defined? Well-designed studio monitors deliver punchy, musical bass. If you can’t hear the note, just “feel” it, it’s probably best to move on to the next set of speakers. Mid-frequency response. This can be challenging to hear because the notorious scooped “smiley face” EQ that is applied to nearly every pair of consumer speakers you've heard. If you're unaccustomed to listening to speakers with a flat frequency response, you may not be used to hearing the mids in your favorite mixes. That being said, good studio monitors will have an even midrange. This is important because vocals and most instruments “live” in the midrange. Make sure you can hear the attack of the snare drum and that the vocals and guitars are vibrant and present. High-frequency response. Are the cymbals and hi-hats crisp and shimmery? Or do they have a brittle edge? Great studio speakers will provide crisp high end without harshness. You should also be able to hear reverb tails and the “breath” in the vocal. Linear frequency response. Do some instruments seem more exaggerated than others? Does the vocal seem to vanish as it navigates the notes in the melody? The speakers you want for your mixing environment must provide a smooth, linear frequency curve throughout their reproduction range. A studio monitor like this will ensure that your mix will translate well from room to room and speaker to speaker. Stereo image. When you're mixing in stereo, you want pair of studio monitors that will provide a wide stereo image. Close your eyes. Can you hear the pan placement of the drums? Can you “hear the room” in which the music was recorded? The better the stereo imaging is on your studio monitors, the easier it will be to separate the components in your mix. Finally, and most important, your personal taste will always be the final determining factor. There is no right or wrong answer. You may love the top end on a pair of studio monitors and mix great records using them, while someone else finds that same top end harsh and edgy. Choose the monitoring speakers that work best for your room, the musical genres you’ll work in, and the way you mix. Go with what your ears tell you. You should familiarize yourself with a few terms as they relate to speakers and their design before going shopping for your new studio monitors. These terms will help you to better understand what type of speaker will best suit your needs. Driver. The driver is the part of the speaker that produces sound waves. The better the quality of the driver, the better it will reproduce sound waves and take the wear and tear a busy mix engineer can dish out. Soft Dome. This round shape of this type of design radiates sound with a wide dispersion pattern to create a larger sweet spot. The larger the diameter of the dome, the wider the sweet spot. Usually made from a high-quality textile, like the silk (as used in PreSonus Eris-series monitors), these designs are known for their smooth and refined sound. 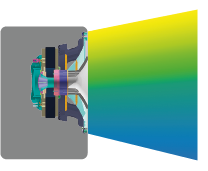 Air Motion Transformer (AMT). This design employs an ultra-light material that is inlaid with an aluminum circuit that functions as a voice coil. This material is folded like an accordion and moves like a bellows, launching sound waves from the two surfaces rushing toward one another. This design provides a much larger projection area than a traditional dome tweeter, so its sound coverage is much larger. For example, the 6.8-inch2 AMT tweeter in the PreSonus R65 and R80 speakers provides coverage equivalent to that of a 3-inch dome tweeter. Because the AMT design is so efficient, it is capable of a very fast transient response, even at ultra-high frequencies. This allows you to hear more of the “air” and “space,” providing a much more natural sound. Low-frequency driver or “woofer.” This driver produces the low-mid and low frequencies for your speaker. Because it is responsible for producing larger sound waves (the lower the frequency, the larger the sound wave), a woofer requires a higher-power amp than tweeters do. High-quality low-frequency drivers are usually made from very tough and stiff materials, like woven glass composite or glass-reinforced paper. Both materials are able to withstand the abuse a woofer takes, and each has its own unique set of benefits. A woven composite driver, like those used in the PreSonus Eris-series studio monitors, provides a constant dispersion pattern, using its woven pattern to break up reflected energy, creating a transparent, cohesive sound. A low-frequency driver made from glass-reinforced paper, like used in the PreSonus Sceptre-series speakers, is lighter, more efficient, and will reproduce the same volume with less power, and is able to better reproduce transients because of its fast response. Note: In a two-way speaker system, the high- and low-frequency elements share the responsibility for mid-frequency reproduction. A three-way speaker system provides a separate driver that is dedicated to mid-frequency reproduction. While three-way studio monitors aren’t as common as two-way speaker systems, they are not unheard of, so it’s important to mention the difference. Acoustic Port. Also known as the “bass reflex port,” an acoustic port redirects the inward pressure produced by the outward movement of the speakers. The backward motion of the diaphragm pushes sound waves out of the port and boosts the overall sound level. Ported speaker designs are much more efficient because the power moving the driver produces two sound waves instead of one. Active and Speakers. Active studio monitors have onboard power amplification that has been designed to optimally power the drivers. This takes the guesswork out of choosing the right speaker/amp combination, because engineering teams have ensured an ideal match. Passive studio monitors do not have an onboard amp and require external power. 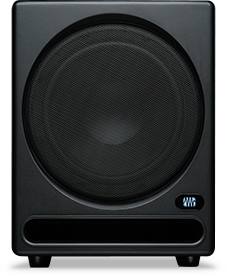 Some speaker systems, like the Eris E3.5 and E4.5 studio monitors, are compromised of one active speaker and one passive speaker. In this type of speaker system, the power amps for both speakers is housed in the active studio monitor. In general, a higher power rating (in watts) will result in more headroom and a stronger, cleaner output regardless of whether a studio monitor is active or passive. Biamplification. A biamped studio monitor has two amplifiers inside: one dedicated to powering the high-frequency driver and the other dedicated to powering the low-frequency driver. By separating the frequencies before they hit the amplifiers, a biamped speaker system removes one of the major sources of intermodulation distortion. The resulting sound is more open and clear and less fatiguing. Crossover. The crossover separates the frequencies coming into a speaker and distributes them appropriately between the woofer and tweeter. This helps the speaker run more efficiently and reproduce the frequency spectrum more reliably because each component is only propogating the frequency range for which it is best suited. 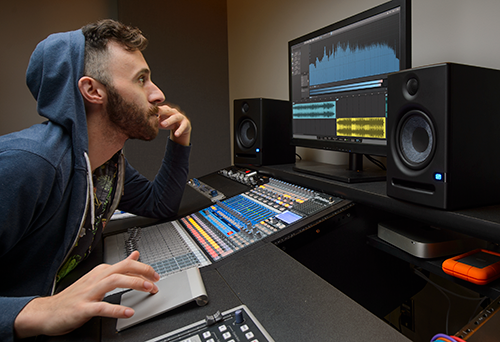 MTM speaker configurations such as the PreSonus Eris E44 and E66 studio monitors feature two midrange drivers that cover the same frequency range, with a high-frequency driver nested between them. Because the two woofers cover the same frequency range and are placed so that their acoustic centers are less than one wavelength apart, the combined signal of the two drivers propagates forward as a single waveform. This provides a much more dynamic output than relatively small size of this type of speaker would normally afford. The two woofers also work to partially contain the dispersion of the tweeter, minimizing phase displacement. This results in smoother frequency response and an ultra-wide, detailed stereo soundstage. A coaxial speaker like the PreSonus Sceptre® S6 and S8 studio monitors places the high-frequency driver in the center of, and on the same axis as, the low-frequency driver, which is similar to the way the human ear works. Coaxial speaker designs offer a symmetrical response both horizontally and vertically. This means a wider “sweet spot” that is more consistent throughout the room. Properly designed coaxial speakers can also offer a seamless crossover transition because of their symmetrical response. Because the high- and low-frequency elements come from the same point source, coaxial speakers can offer an ultra-wide sweet spot, more realistic and reliable transient reproduction, and an amazing 3D soundscape. However, to get the benefits that a coaxial speaker can theoretically provide, great care must be taken to ensure that the phase- and time-alignment are accurate. Copious amounts of processing, such as provided by the DSP onboard each Sceptre studio monitor, is required to run the alignment algorithms and FIR filters needed for optimal coaxial performance. One Pair of Speakers or Two? As mentioned earlier, listening to your mix on multiple pairs of reference speakers can provide new insights into your mix by giving you a different perspective. If you’ve decided to purchase another set of studio monitors, choose speakers that are different enough from one other to get the result you desire. For example, if your main pair of mixing speakers are eight-inch coaxial studio monitors, like the Sceptre S8, you may also want to purchase a smaller pair of traditional two-way speakers like the Eris E5 studio monitors. A set-up like this will allow you to mix on studio monitors with detailed bass and a lifelike, three-dimensional Z-plane then reference it on a smaller pair of studio monitors with narrower stereo image and frequency range to see how it will translate across various speaker systems. If you add a second or third pair of studio monitors to your mixing rig, you’ll also need to add some sort of speaker-management system, like the PreSonus Central Station Plus or Monitor Station V2 studio monitor controllers. These products not only allow you to easily compare your mix on different pairs of speakers, they also provide source switching so that you can compare your mix to another mix in the same genre. 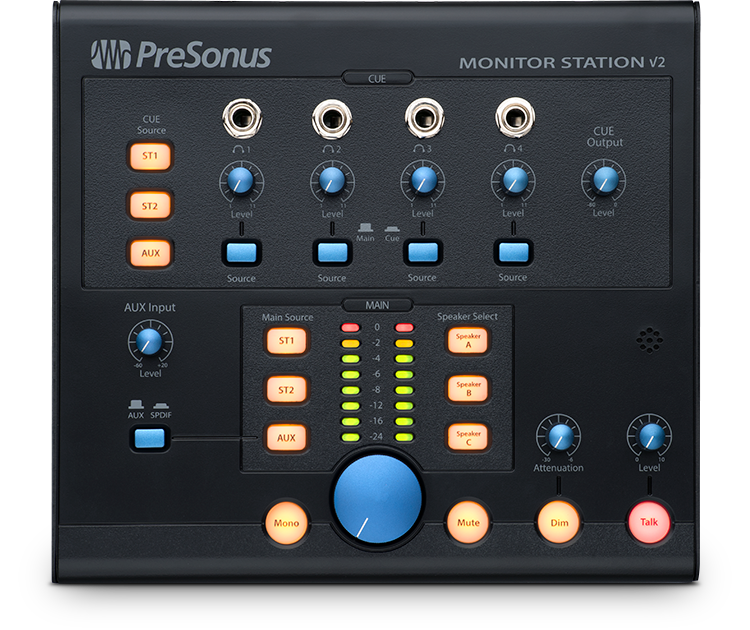 Some studio monitor controllers, like those made by PreSonus, are also designed to become the central hub for your studio and will provide extra headphone mixes and talkback systems, so they’re well worth the investment. The Sweet Spot: How Wide is Wide? 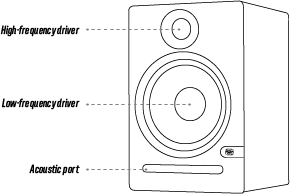 When shopping for studio monitors, you will most likely read a lot about “the sweet spot.” This is the middle position between the two sides of a stereo system, where the speakers overlap, and it is where the stereo image will be the best. In general, the wider the sweet spot, the better the stereo imaging will be. While all studio monitors are designed to perform in a stereo system, some variations of studio monitors are designed to provide exceptional stereo imaging. Wide: AMT speakers like the PreSonus R65 and R80 studio monitors will provide a wider stereo image than a conventional two-way studio monitor because of their unique high-frequency driver design’s superior coverage area and its ability to reproduce lifelike audio. Ultra-wide: MTM speakers like the PreSonus Eris E44 and E66 studio monitors utilize their dual woofers to contain the dispersion of the tweeter centered between them to limit phase displacement and create an ultra-wide stereo field. Ultra-width plus depth: Coaxial speakers like the PreSonus Sceptre S6 and S8 studio monitors utilize their symmetrical response and single acoustic center to provide the widest and most three-dimensional stereo image. Subwoofers have become common in car and home stereo systems. Because ultimately your mix is going to played in someone’s car or through their desktop speaker system, you should consider verifying the deep bass content in your mix, especially if the target listener for your mix is going want to hear and feel that extended low end. Adding a subwoofer to your speaker system will make the wiring and calibration of your studio monitoring set-up a bit more complex, but when carefully tuned to the stereo full-range system, a subwoofer will naturally extend the low end without overshadowing your full-range speakers. A properly calibrated 2.1 speaker system can improve your mixing environment by offloading much of the bass-frequency reproduction to the subwoofer, letting the low-frequency drivers of the full-range speakers focus on the low mids. 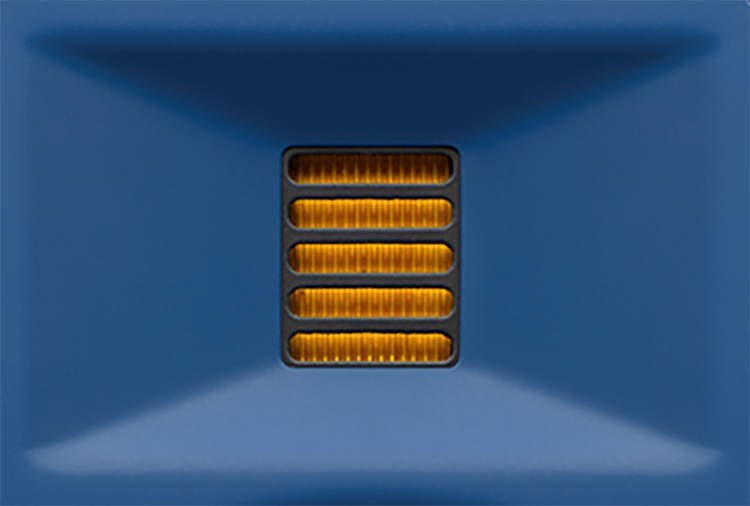 Some subwoofers, like the PreSonus Temblor™ T10, let you momentarily bypass the subwoofer with a footswitch, allowing you to compare your mix with or without the subwoofer engaged. This is very important, as it lets you ensure that the bass in your mix will work equally well on stereo speaker systems without a subwoofer attached. Like all PreSonus subwoofers, both the PreSonus Temblor T10 and T8 provide an onboard variable lowpass filter. This allows you to fine tune the crossover transition between your full-range speakers and your subwoofer, ensuring a more even frequency response. If your studio subwoofer does not provide this feature, you should consider purchasing an external crossover for this purpose.